It is the core of what we do. When we truly excel at our jobs, we create demand where little or none existed. Perhaps the quintessential example of this is Apple’s iPhone. Nobody knew they needed an iPhone in 2007 when Steve Jobs stood onstage and introduced the revolutionary device to a bewildered audience. In fact, Apple didn’t even realize the demand it was creating. “Today, we’re introducing three revolutionary products,” Steve said at the iPhone’s debut. He went on to explain how the new widescreen iPod, the revolutionary mobile phone, and the new “internet communicator” were all contained in one device. The audience had no idea how to react. Apple successfully created a market where none existed. But creating markets isn’t just related to introducing new, revolutionary products. Great marketers can differentiate in a crowded marketplace to create a competitive advantage and niche for their brand. Think about software company HubSpot. In 2006, the marketplace for email marketing automation software was crowded – and getting more so. HubSpot created demand in a different way. It invented a new category of digital marketing – calling it “inbound” – and carved a niche for itself in the business software marketplace. In many cases, businesses struggle with generating new demand. In today’s noisy, fragmented, digital world, reaching prospective customers feels overwhelming. Pressure to deliver against short-term goals and to measure efforts to use valuable content to generate new demand seems tougher than ever. The growing complexity of the buyer’s journey, coupled with the highly competitive and loud marketplace of ideas, makes it arduous to differentiate your solutions, much less educate prospects on new things. However, demand generation is perhaps the most critical need for today’s business. Marketers must continue to generate more opportunities to support their companies’ growth strategies. Is it any wonder then that many marketers are doubling down on finding people who already ask for their products, services, or solutions? While this approach is important, the results inevitably flatten over time. The total addressable market (TAM) aware of whatever the challenge is will be exhausted. Any marketing effort only focused on identifying existing demand will inevitably go from extraordinary to average to poor. From a content marketing perspective, how do you go from poor to average to extraordinary? How can you view content marketing as something that can differentiate your approach to demand generation and produce more demonstrable results for your marketing efforts? Well, we sought to find the current state of demand generation within content marketing and how it might be improved. To explore this concept, CMI’s research team conducted a survey to learn how marketers use content marketing for demand gen. 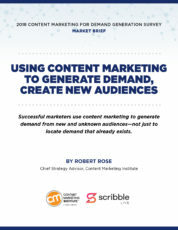 The resulting market brief, Using Content Marketing to Generate Demand, Create New Audiences sponsored by ScribbleLive, urges content marketers to establish the value of their demand gen efforts. Here are five action items based on key findings. 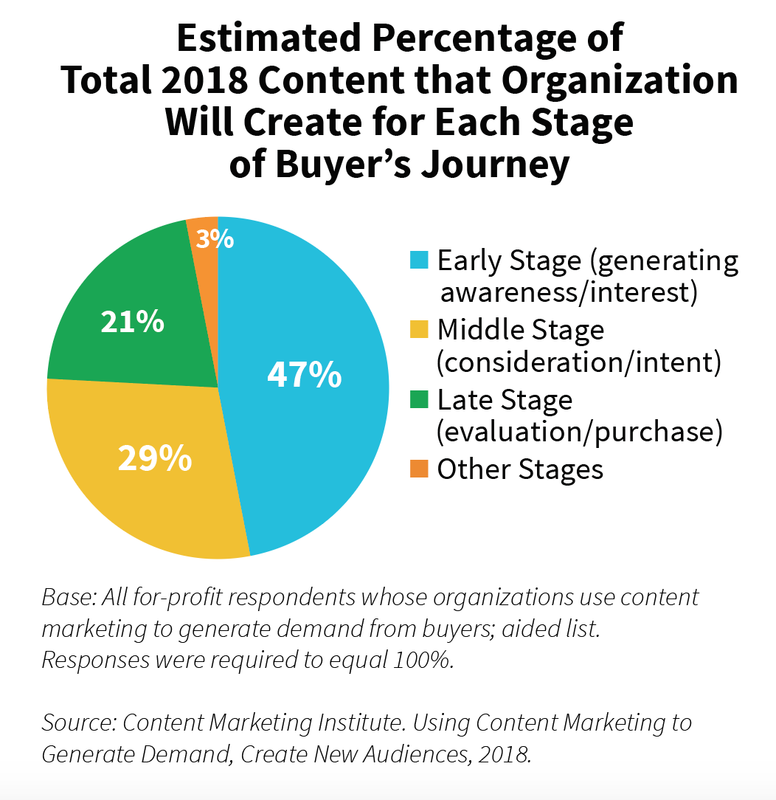 However, interestingly, half the respondents created content in 2018 for deeper parts of the funnel as well. Many of the content marketers also focused on the middle (29%) and bottom of the funnel (21%) where the lead is converted to a customer. To paraphrase the great comedian Jerry Seinfeld – it’s not enough to gather the attention of a new prospect. You have to hold it as well. 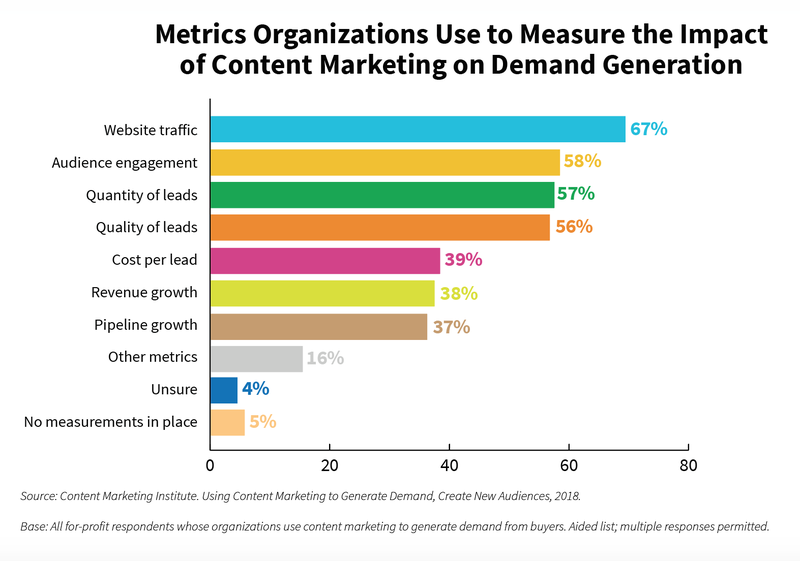 These results suggest successful demand generation is not possible by simply creating content for the top of the funnel. Success is derived by connecting content-driven experiences deeper in the funnel – the interest and education of the new prospect are held throughout the journey. Respondents said blog posts are the most effective type of content used in the early stage, white papers in the middle stage, and case studies in the late stage. In-person events were the only type rated equally effective at all stages. Certain types of content work well at the top of the funnel, though that does not preclude them from working in the latter stages. Your mileage will vary when it comes to content types and the best success. Stop thinking about content types being only appropriate for one stage of the journey. Experiment with how these content types are even structured. For example, a case study may work wonderfully at the very top of the funnel if it’s structured more as an educational awareness piece. A white paper may work well to convince a customer if it’s more focused on the implications of the change being considered. The key is to not start with form and apply it to the funnel. Instead, start with story (or content value) and apply multiple outputs to that content. Then test like the dickens. In our study, the top three metrics marketers use to measure the impact of their content are primarily vanity metrics associated with upper levels of the funnel (website traffic [67%], audience engagement [58%], and quantity of leads [57%]). Vanity metrics such as traffic, engagement, and volume of leads are only as important as indicators for how you are progressing toward your goals. For example, if your overall objective truly is to generate new demand – one measurable goal might be to generate x% of leads from a new audience or in a new region. In that scenario, more traffic, engagement, and leads may not be good news unless they are associated with your goals. Design your measurement plan to assist with the ability to meet both short- and long-term goals. 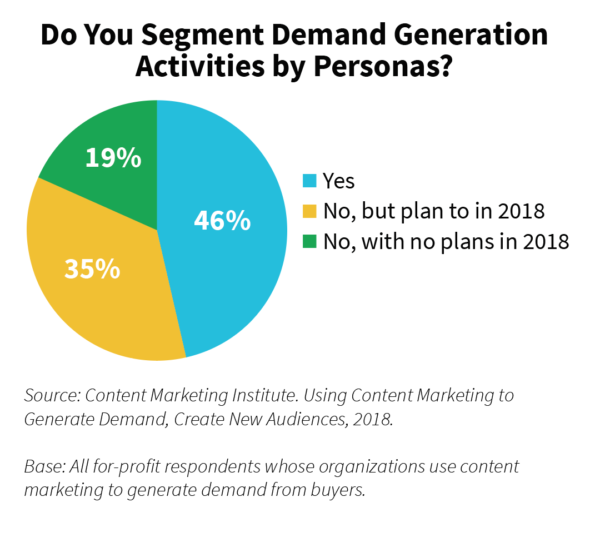 We asked respondents if they segment their demand generation activities by personas and fewer than half (46%) said yes. However, another 35% said they plan to do so. Personas provide tremendous structure and insight that enable you to attract the most valuable visitors, leads, and customers to your business. Remember, however, audience personas and buyer personas are different. Buyers are, of course, people who have discovered that a solution like yours might be what they need. In short: Demand has been generated. Audiences are the ones who are unaware that they have a need or want, or that a solution even exists. If you are focused on demand generation, you may be better served by focusing on audience personas. Have a look at alternative ways of developing focused audience personas. The bottom line is you need personas to help you deliver the most relevant and useful content to your audience. 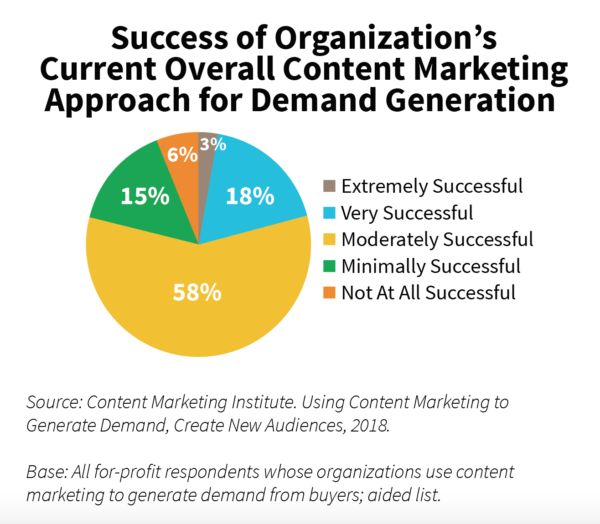 The majority (58%) of respondents reported moderate success with using content marketing for demand generation (a finding that mirrors that in our 2019 B2B annual content marketing study). 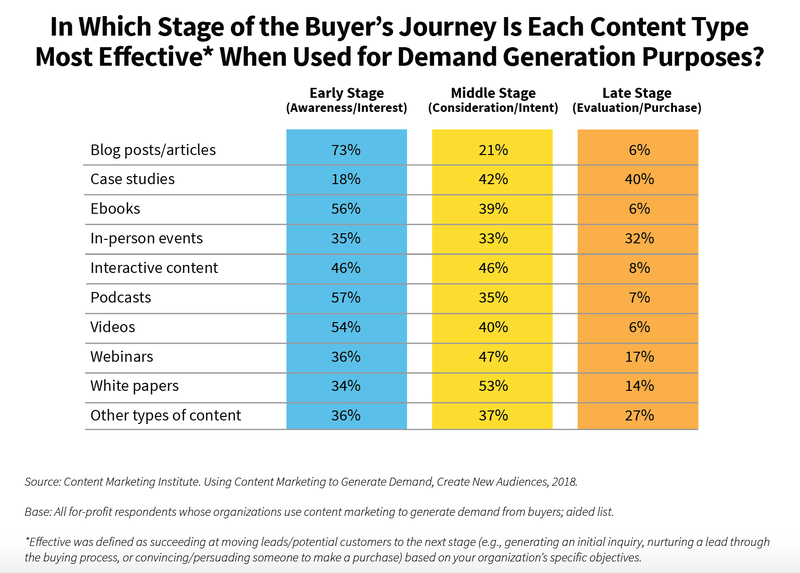 Marketers looking to improve their success with using content marketing for demand generation should make audience acquisition a core focus for creating value for the business. This approach requires that marketers look beyond vanity metrics such as website visits, engagement, and even quantity of leads, and be willing to experiment with different types of content and how the audience uses it. Audiences can bring more value than leads or buyers. They are assets that can provide numerous benefits to the business – and demand generation programs fueled by content marketing can be just the thing to create these assets. The great promise of content marketing is that it builds an audience. And audiences can bring more value than leads or buyers. Yes, some of them will become identified demand. They become leads, opportunities, and buyers. Most of them, however, won’t – not in the short term. But that doesn’t mean they’re without value. Audiences are not just potential buyers, they are helpful to both generate new demand and give the insight to be continually better. In short, audiences are not just potential buyers today, they are markets ready to be made tomorrow. In the short term, audiences are benefits to the business to help share and recommend the value of your approach and to be more efficient in reaching their networks. In the long term, audiences are the demand you can create. Marketers make markets. They not only identify demand, they generate it, too. Content marketing that builds an audience can do exactly that. Get more insight and survey results; download Using Content Marketing to Generate Demand, Create New Audiences today.